A good coffee grinder is not something to skimp on. The wrong choice can ruin an espresso machine, make your drip brewed coffee too weak, or generally just take all the enjoyment out of a cup of coffee. To stop all that from happening you’re going to want the best burr grinder that also will look great in your kitchen. This makes Breville Smart Grinder (BCG800XL) worth at least checking out. Breville has an excellent reputation for quality with their small kitchen appliances and with this burr coffee grinder have made a product with a lot of pro features, but that’s still available at a reasonable price. The Breville BCG800XL Smart Grinder comes in three colors, Silver, Bright Cranberry Red, and Black Sesame, and continues the line of smart grinders that automatically adjust the dose as you change settings. 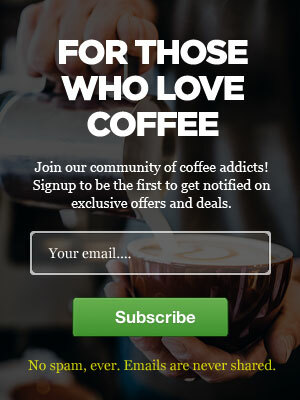 They’ve managed to make it easy to use, but with enough customization options to suit almost any coffee lover. 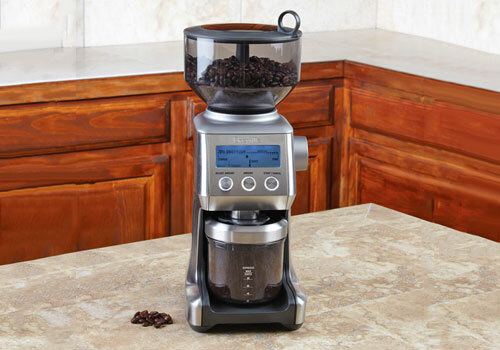 Breville Coffee Grinder is one of the best coffee grinder available in the market. So in this Breville Smart Grinder review, let’s take a look at how this product stands up. Breville has been making coffee grinders for some time and with this one, they have really listened to customer feedback. In the same mid-range price as previous models they have created a machine with a wide range of features and that integrates will all kinds of coffee makers. 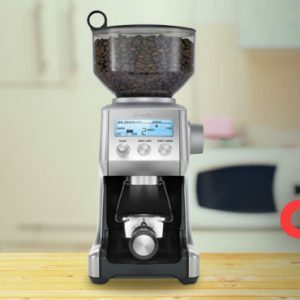 Before we proceed any further, let us have a sneak peek into the brilliant features of Breville Coffee Grinder in this quick video. Now, let’s discuss all of these features in more details. 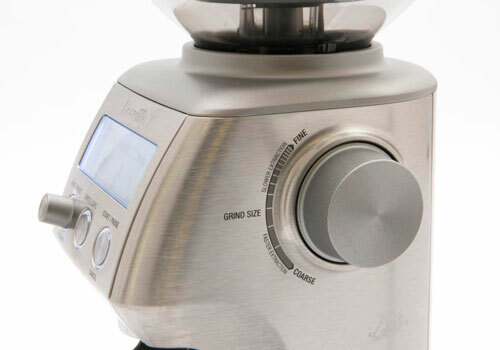 Having different grind settings is a big part of the reason for spending extra a burr grinder. With 25 preset settings, this grinder covers the whole range of coffee types including grinds for French press, drip, percolator, and espresso coffee. The additional range allows for a degree of fine tuning in order to find the right fit for each coffee machine’s unique requirements. More importantly, this Breville Coffee Maker produces a very consistent grind quality at each setting. Have accurate and repeatable presets makes it possible to learn the machine, and then go back to what has worked in the past with the confidence it will work again and again. A great cup of coffee doesn’t just depend on the right grind, the amount of coffee used for brewing also makes a big difference. The auto dosing feature is the main selling point of the Breville Smart Grinder, and it essentially means that the machine knows how long, and what amount to grind to give the right amount at each grind setting. They call it their ‘Dosing IQ technology‘, and it means a lot less fiddling with different options when you just want a cup of coffee made. It doesn’t, however, mean the user has to give up control. All the standard manual options are still available if you need to customize your grind more than the auto settings allow. The 1-pound removable hopper is large enough to keep a single person going for days, or serve all the people at a house party. They’ve made the hopper very well, keeping it airtight, and sealed with a silicone gasket. This will keep the beans fresh for any reasonable amount of time it might take to go through them. An additional feature is that the hopper has a simple locking mechanism so that the container can be removed without needing to empty the beans first. All the parts fit together very neatly, and the hopper can be attached or detached with ease and no mess. 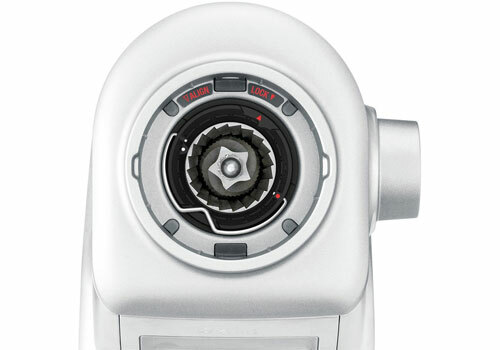 Breville’s experience in small kitchen appliance design shows in both the position and layout of the controls. The backlit LCD screen makes it easy to see and adjust the many different settings, and the few simple controls are conveniently placed on the machine. The grind settings can be controlled through a main dial which gives four click stops between each visible setting. 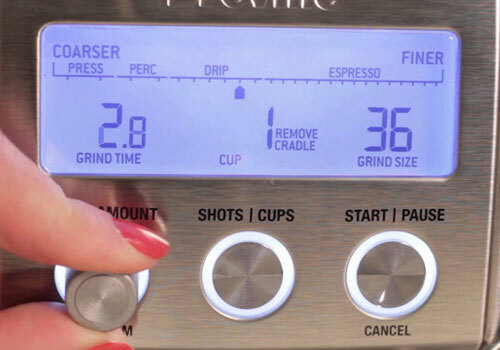 Additional customization controls include the ‘Adjust Amount‘ for weaker or stronger coffee, and the ‘Amount’ to control the number of cups or shots it grinds for. A very straightforward visual display shows where the current settings fall in the grind range, and has a simple little scale for the more/less finer adjustments. Without sacrificing usability, the machine has a compact size that takes up very little counter space, while looking pretty good sitting there. Breville’s done an excellent job of space efficiency, without sacrificing the usability of the controls or detachable parts. This specific model (BCG800CBXL) comes in a nice cherry red color that’s still muted enough to fit in with almost kitchen design. In additional to all of that, the machine is also very quiet. These things give it a modern, low-profile appeal, that won’t wake the neighbors when you turn it on. All in all the list of features covers everything the average home coffee lover needs to make a great cup of coffee. 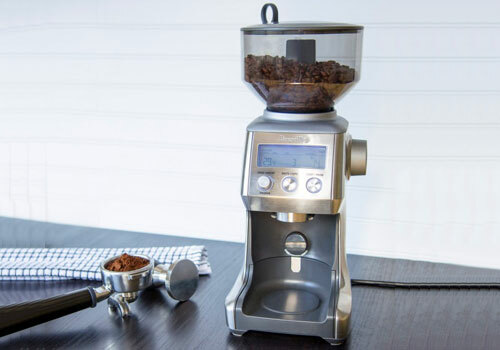 Even with such a wide range of options, the Breville BCG800XL Coffee Grinder manages to stay down to earth with a simple user interface, and easy to clean design. This Breville Coffee Machine has been on the market for a few years now, and in that time customers have had the chance to really get used to in and figure out what where the grinder succeeds and fails. No product is perfect, but the list of pros and cons should help you to decide if it is what you are looking for. Why Choose the Breville Smart Grinder? What the Breville Coffee Grinder has going for it is mainly that it is a conical burr grinder that covers most types of coffee well, and does so at a reasonable price. At this cost, you’re not going to find an incredible machine that does everything perfectly, or something that will hold up to extremely heavy usage. 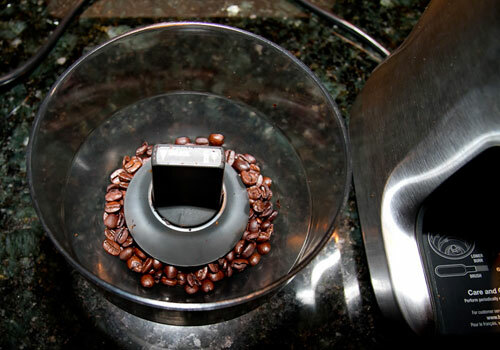 This grinder will, however, do more than enough for the average coffee lover’s consumption, and at the same time, it will make it easy change between whatever style of coffee you feel like. The convenience and consistency of the grind, dosing, and the number of cups settings, are a big part of what makes this product enjoyable to use. Once you find the right grind settings for different kinds of coffee, you can reliably go back to them with a few quick adjustments. The Breville Coffee Machine’s auto dosing works surprisingly well to adapt, and gives out the right amount each time. Also, the volume (amount of coffee) translates well into the real world. It’s a small thing, but there are other grinders out there that can leave you wondering exactly what kind of cups the designers were using. A grinder is not really a showpiece item, and this one’s relatively attractive appearance, and small kitchen footprint make it a nice addition to any household. The fact that it won’t wake the neighbors when it’s grinding is something your family might appreciate as well. The way it keeps a low profile is a good analogy for the experience of using this machine. It’s something you want, if you don’t want a coffee grinder that you really need to think too much about. Still not convinced? 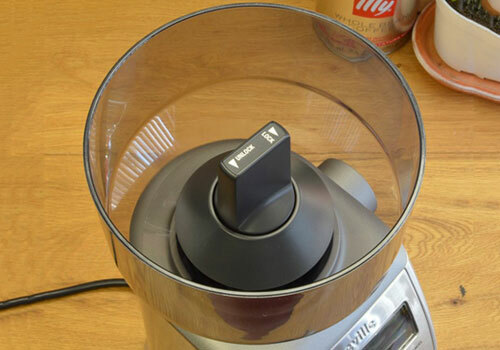 Here’s a quick video review of the Breville BCG800XL Smart Grinder by Whole Latte Love. Before making a decision about the Breville Smart Grinder you really want to ask yourself how much you want to spend, and how obsessed with coffee you are. For the price, this is probably the best available option for a conical burr grinder with a wide range of grind settings. One of the more common complaints that come up about the machine is that it doesn’t tend to last past few years. More expensive grinders on the market tend to be more durable just due to the quality of parts that are used, particularly the motors. 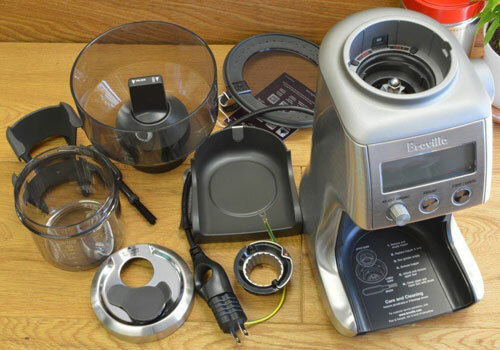 It’s not a guarantee the Breville Coffee Maker will die after few years, but judging from other users it is a risk. The other side of it is how much you love coffee, particularly espresso. If you’re partial to any other kind of coffee, this machine works great. It’s not always the coarsest for a French press, but for drip coffee, percolators, or any other choice it has no problems producing the right grind time and time again. Except espresso, so if that’s something you can’t live without, then this is not the best option for you. Overall though, Breville has done an excellent job of marrying a wide range of feature with high usability. The sheer number of decisions to make when you really start getting into coffee can be very intimidating, not to mention the moments before that first cup of coffee in the morning when you may not be as sharp as possible. 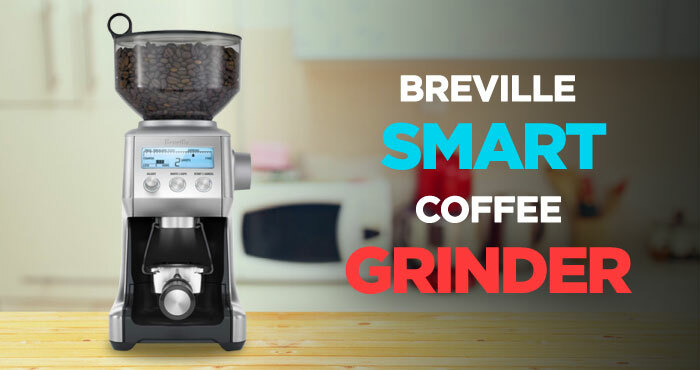 With the interface, easy to use settings, and auto dosing feature, the Breville Smart Coffee Grinder makes it easy to get a great cup of fresh ground coffee every time. Breville Smart Grinder (BCG800XL) was reviewed by Tim Forman on July 18, 2018. *Disclaimer: Our Breville Smart Grinder Review is based mostly on our expertise and the experts we consulted with and the information provided by the manufacturers. We do test many products, but it’s not possible to test them all. As such, please remember the above recommendations are our opinions, and before using any product, please check manufacturer’s website for more information.